In normal computers, bits are the smallest unit of information. 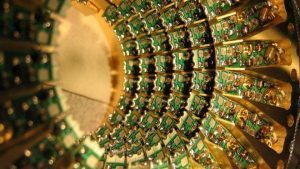 Quantum computers use qubits which can also be set to one of two values. A qubit can be any two level quantum system Such as a spin and a magnetic field or a single photon 0 and 1 are this system’s possible states like the photons horizontal or vertical polarization In the quantum world, the qubit doesn’t have to be just one of those It can be in any proportions of both states at once This is called superposition. But as soon as you test its value, say, by sending the photon through a filter It has to decide to be either vertically or horizontally polarized So as long as it’s unobserved, The qubit is in a superposition of probabilities for 0 and 1 and you can’t predict which it’ll be But the instant you measure it collapses into one of the definite states. Superposition is a game changer. For classical bits can be in one of two to the power of four different configurations at a time. That’s 16 possible combinations at which you can use just one for qubits in superposition, however, can be in all those 16 combinations at once. A computer is made up of very simple components doing very simple things. Representing data, the means of processing it, and control mechanisms. Computer chips contain modules, which contain logic gates, which contain transistors a transistor is the simplest form of a data processor in computers, basically, a switch that can either block or open the way for information coming through this information is made up of bits which can be set to either 0 or 1. Combinations of several bits are used to represent more complex information. Transistors are combined to create logic gates which still do very simple stuff. For example, an AND Gate sends an output of 1 if all its inputs are 1 and an output of 0 otherwise. Since all basic operations are literally simpler than first-grade math, you can imagine a computer as a group of 7-year-olds answering really basic math questions. A large enough bunch of them could compute anything from astrophysics to Zelda. However, with parts getting tinier and tinier. Combinations of logic gates finally form meaningful modules, say, for adding two numbers. Once you can add, you can also multiply, and once you can multiply, you can basically do anything. Quantum physics are making things tricky. In a nutshell, a transistor is just an electric switch. Electricity is electrons moving from one place to another. So, a switch is a passage that can block electrons from moving in one direction. Today, a typical scale for transistors is 14 nanometres which are about 8 times less than the HIV virus’ diameter and 500 times smaller than a red blood cell. As transistors are shrinking to the size of only a few atoms Electrons may just transfer themselves to the other side of a blocked passage via a process called Quantum Tunnelling In the quantum realm, physic works quite differently from the predictable way were used to and traditional computers just stop making sense. We are approaching a real physical barrier for our technological progress. 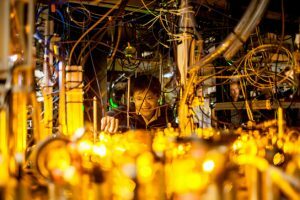 To solve this problem, scientists are trying to use these unusual quantum properties to their advantage by building quantum computers.